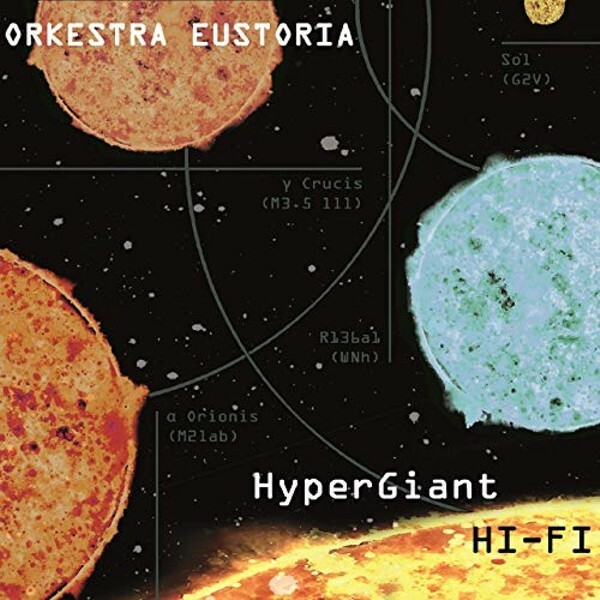 When you first encounter the impressive debut of Orkestra Eustoria, the ensemble's name and album title, "HyperGiant Hi-Fi," seem to perfectly fit the otherworldly sound. But the key to the band's success lies in the expansive musical scope of this world. Founded by saxophonist Peter Sparacino in the ethnically diverse New York City borough of Queens, Orkestra Eustoria includes musicians with an international array of roots: guitarist Aki Ishiguro, keyboardist Isamu McGregor, bassist Panagiotis Andreou, and drummer Engin Gunaydin. Producer David Binney plays synthesizers and Sarpay Ozcagatay plays flute on one track. Sparacino, who wrote all the tunes except the short "Intro", moved to New York from San Francisco in 2008. Since then he's played and toured with a variety of bands when he's not doubling in pit orchestras. In terms of time signatures, voicings and sonic textures, compositions like "InterDweller" and "Le Bumpier" beautifully reflect the myriad genres Sparacino has been exposed to in his musical journey.